Dimensions: 33.8" x 15.7" x 32.5"
The Silentaire Val-Air 150-50 AL Compressor is a powerful yet noiseless solution from Silentaire Technology designed specifically for the needs of professional airbrush artists. Among Silentaire compressors, this model is one of the most heavy-duty compressors presented by the company. Combining many years of experience with modern production methods the company successfully manufactures some of the most popular quiet air compressors in the industry. Due to ongoing researches and resilience of Silentaire workers, these air compressors move the market to a new level of quality, efficiency, and low noise operation. What's more, a wide range of these compressors is, indeed, able to keep up with all customer requirements and endure the most demanding and heavy jobs. All this has rightfully built them a strong reputation of the most reliable and trouble-free quiet air compressors worldwide. All air compressors presented in this product line feature a very quiet and totally automatic operation. Equipped with a pressure switch, these compressors provide you with a really enjoyable and undisturbed airbrushing. When the air pressure in the tank grows up to its maximum value, the switch automatically shuts the motor off. Then, it will also automatically turn the motor on once the pressure lowers to its minimum. With this feature, you don't need to watch the pressure but give yourself completely to the job. Apart from that, the manufacturer has improved Val-Air units with "AL" 1/2 HP motors with aluminum heads and cooling fins allowing compressors to cool down faster. a carrying handle or wheels for extra portability. 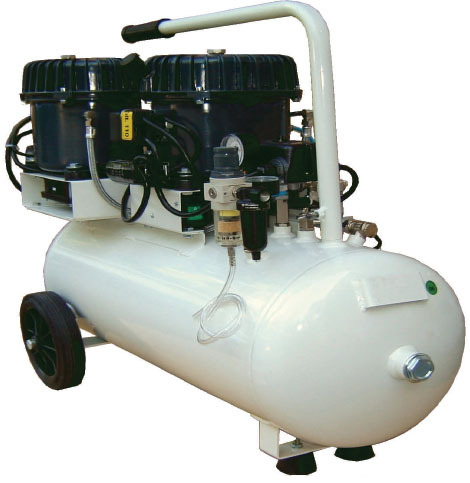 This compressor is built to deliver consistent air flow during hours of work almost without any environmental noise. That's why the Val-Air 150-50 AL compressor model has become a top choice for professional airbrush projects among other alternatives. Built-in electric cooling fans for each motor. Besides, you will also find an oil bottle type ROLOIL - SINCOM/32E, instruction manual, and a tank certificate in a package. The Silentaire Val-Air 150-50 AL is guaranteed by the manufacturer for 1 year from the date of purchase. This warranty saves you money on repair and replacement of those compressor parts that the manufacturer determines as defective. But the electric parts and worn parts are not under guarantee. Mind, the guarantee automatically ends in case of improper use or tampering. So do not try to repair the compressor on your own.